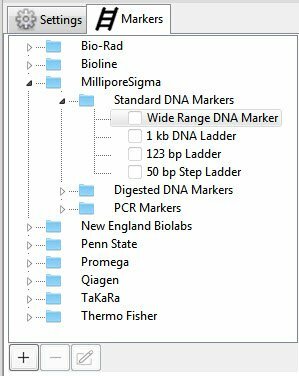 The Markers panel, represented by a ladder icon, lets you choose which molecular weight marker to apply to a lane in the Gel Simulation view. The Markers panel becomes available only after you initiate an agarose gel simulation using the File > New Agarose Gel command. Expand the file tree as needed to locate the marker of interest from an extensive list of commercially-available markers or custom markers. Any custom markers created using the procedure further down this topic are located in a folder called User. The marker is typically applied to the first lane but may be applied to any desired lane. Use the mouse to drag the marker from the Markers panel and drop it in a lane in the Gel Simulation view. Select a lane in the Gel Simulation view and then go to the Markers panel and check the box next to the marker you wish to add. If you added a marker in error, use Edit > Undo marker choice to revert the lane to its previous state. Common custom markers include digests of Lambda, phiX174, pBR322, and pUC19, but you can add any custom marker using this procedure. Click the plus sign in the bottom left of the panel. Type in a Title for the marker. 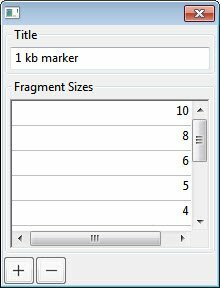 Type each Fragment Size on a separate line. To add a line, click the plus sign icon. To delete a line, select it and click the minus sign icon. When all information has been entered, save and close the marker by clicking on the red ‘x’ in the corner. The marker now appears at the bottom of the Markers panel in a folder called User. Select the marker from the User folder. Press the pen & paper icon in the bottom left of the Markers panel. Follow the directions above to change the title or fragment sizes. Select a custom marker in the Users folder by clicking on its name. Then press the minus sign in the lower left of the panel. When prompted to confirm, click OK.